Riccardo Gardelli had played basketball on a club team in Varese, Italy for 10 years. But he had to start from scratch when he decided to come to McNary as an exchange student. “It was like starting from zero,” said Gardelli, who came to America in August through Cultural Homestay International. While Gardelli wanted to travel the world and meet new people, his main reason for coming to the U.S. was to get better at basketball. He didn’t know where in the country he would end up. Gardelli began playing club basketball when he was 7 years old for Pallacanestro Varese, the professional team in his hometown. Since Italy’s high schools don’t have athletic teams, the kids play on club teams. Gardelli’s club season lasted nine months. “It was a little bit hard because it was like my second family,” Gardelli said of leaving his club. College basketball also doesn’t exist in Italy. “In America, you have the possibility to win a scholarship if you’re good. In Italy, that’s not possible, because you don’t have sports in college. So after under-18, you have to go to a pro team,” Gardelli said. “If you’re not good enough, you’re not going to make it. You’re career is going to stop there. Gardelli’s exchange program ends on June 16. After playing in college, Gardelli would like to return to Italy to play professionally. “I went to America because I wanted to improve my basketball and then come back to Italy more ready to play on a pro team,” he said. While Italian students are taught basic English beginning in elementary school, Gardelli said he didn’t really begin to study the language until three months before he came to the U.S. in August. Gardelli’s first introduction to American basketball came while playing for McNary in a fall league. He barely got on the court in the Celtics first regular season game, entering for the first time in the second half of a 68-54 win over Grants Pass on Nov. 30. But by the third game, Gardelli was starting. “The main problem was the language and understanding the plays,” said Gardelli, who had never played zone defense before. Gardelli handled the ball more in Italy and was usually one of his team’s top scorers. He’s played primarily forward at McNary and had to buy-in to the Celtics’ philosophy of playing unselfishly on offense and working hard on defense. There’s also more scouting of other teams. Gardelli also realizes he’s new to the team while other players have been in the program for four years. 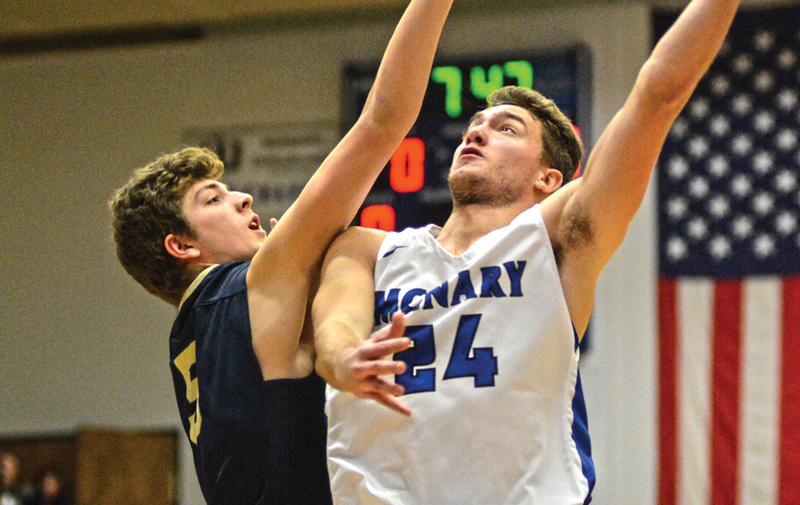 Gardelli has remained in the starting lineup, averaging eight points and 3.7 rebounds per game as McNary as opened the season 13-4. Gardelli has also enjoyed playing in front of larger crowds. While in Italy a good game drew maybe 120 people, the gym was packed when the Celtics hosted rival West Salem on Jan. 5. Gardelli is staying with a host family. Since the legal driving age is 18 in Italy, he doesn’t have his license. While he’s yet to witness his first college or NBA game, the family has taken him to see Silver Falls and Crater Lake. He misses his own family, Skyping with his parents every two weeks. While Christmas is big in Italy, Thanksgiving was new. While school has been more challenging due to the language, he likes the flexibility of picking his own classes. At Gardelli’s school in Italy, students stay in the same classroom for the entire day. The teachers move. But Gardelli’s stay in America, however long it might be, always comes back to basketball.